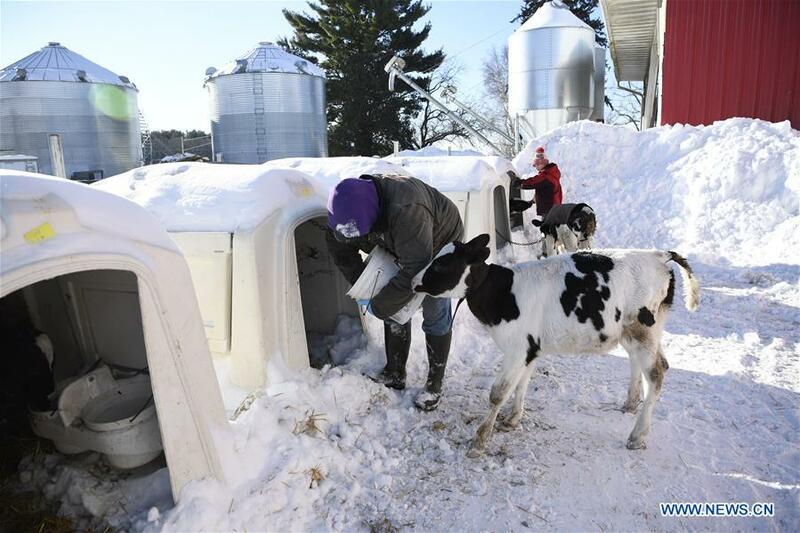 PITTSVILLE, the United States, Feb. 19 (Xinhua) -- Brad Kremer, a farmer from the midwestern U.S. state of Wisconsin, got up in dawn's early light on a snowy mid-February day to feed his 20 calves. The Kremers live in the city of Pittsville in central Wisconsin, where their family farm, Hillcrest Family Farms, consists of 1,200 acres of soybeans and 1,800 acres of corn, wheat and alfalfa. They also own a dairy with 400 animals and a facility where they dry and store the grain. For farmers like Kremer who have benefited from China's demand for U.S. soybeans, an already weak agricultural sector coupled with the ongoing trade frictions between the United States and China have added to their financial woes. Although the trade tensions with China are not the sole reason for the plunge in grain prices in the past year, farmers in the region said they hope the two countries can resolve the disputes as soon as possible, since exports to China are "absolutely" a main factor influencing their livelihood. "The dairy has been depressed for a couple of years now, so it seems like it's almost piling on when you have the (low) soybean and corn prices," Kremer said. "It's stressful across the board. I think every sector of agriculture is feeling a very tightening of the belt and certainly a depressed revenue." Kremer said farmers are still fighting a negative basis at the local grain elevators. Calculated as cash price minus futures price, basis is an important tool for farmers to decide whether to sell their grain at a certain time. The wider the negative basis is, the thinner the profit margin for growers will be. "Soybeans last year was over a dollar negative basis," Kremer said. "That's a dollar a Bushel we lose just from a basis standpoint." Dewey Stelzner, plant manager of U.S. agribusiness group Archer Daniels Midland in Stevens Point, Wisconsin, said there were some opportunities for farmers to sell their soybeans "at a decent price" last spring, before the trade tensions with China escalated and the tariffs were put in place. However, at least 50 percent of the farms he dealt with missed the opportunities, he said. "Usually, the 10-year history shows us that in the early spring, it is a good time to sell for the fall crop," he said. "But since that point, with a lot of things that were going on -- the tariffs and everything else -- that opportunity really went down fast, and that hasn't rebounded yet." Stelzner said that in the past four months, soybean basis at one point dipped to a level that he had never seen since entering the business some 30 years ago. Data released Thursday by the U.S. Department of Agriculture (USDA) showed that after surging to a record 58.96 million metric tons in the 2016-2017 season, U.S. soybean exports fell to 57.9 million metric tons in the 2017-2018 season, and are not expected to exceed the peak until the 2026-2027 season. The 12-month season starts Sept. 1. While China's retaliatory tariffs played a role in driving down the prices of U.S. soybeans as Chinese businesses turned to South America for alternatives, other factors are also at play. Don Lutz, a soybean farmer based in nearby Scandinavia village, said farmers have been shifting from dairy and corn to soybean over the decades, resulting in a persisting bump in soybean inventories across the area that has contributed to the continuous widening of negative basis. "We've seen more soybeans grown in this area probably every year over the last 30 years," Lutz said. According to the USDA data, the total soybean planting area across the United States increased from 75.7 million acres in 2008 to 89.1 million acres in 2018. A third reason, according to Lutz, has to do with the lack of diversity in the structure of Wisconsin's soybean industry. "Wisconsin really exports all of its soybeans because it doesn't have any processing plant," he said. "And so in essence, they're either going to go for export ... or they go out of state, get processed for feed, and those feed products are brought back here." To mitigate the blow to U.S. farmers, the Trump administration directed the USDA Farm Service Agency to launch a Market Facilitation Program (MFP) last September, through which eligible producers of soybeans, sorghum, corn, wheat, cotton, dairy, hogs, shelled almonds and fresh sweet cherries would get a direct one-off subsidy. According to information from the USDA website, applications for the program ended on Thursday. Kremer said that he had not yet received the bailout money, and that even if he received it, it is not even close to making up for what he lost. "It's not something that's going to make us profitable by any means." "To give you an idea ... the monies -- and I haven't received them yet -- but when I do get them, they won't pay my power bill on the farm this year," Kremer said. Kremer, who is also treasurer of the American Soybean Association that helped lobby for the government aid initiative, said the program did soften the blow, "but it doesn't even pay my electricity bill, so I'd much rather be able to sell my soybeans at a fair market price." During the week-long China-U.S. trade consultations in Beijing, which concluded on Friday, the two sides had in-depth communication on mutual concerns including technological transfer, intellectual property rights protection, non-tariff barriers, the service industry, agriculture, the trade balance and an implementation mechanism. Beijing and Washington reached consensus in principle on major issues and had specific discussions about a memorandum of understanding on bilateral economic and trade issues. The consultations are scheduled to continue in Washington this week. Concerning the trade talks, Kremer said he hopes the two sides will "get the politics out of" their trade relationship and resolve their frictions as soon as possible. Noting that he had "a good relationship in the last few years" with Chinese buyers, Kremer said, "My hope is that they can remove these tariffs and come to an agreement that moves things forward." "It's affecting family farms. It's affecting people in the countryside," he said. Kremer predicted that when the two countries reach an agreement that enables U.S. soybean farmers to again export their produce to China, a "fast response" will occur in soy prices, which could rebound 10-11 U.S. dollars per Bushel at the Chicago Board. "At that point the farmers certainly aren't getting rich, but they're making a little bit of margin to stay afloat and to continue to be in business," Kremer said. U.S. farmers have always valued the Chinese market. Lutz said, "it's something we worked hard to build and felt it was a win-win situation." He said he thinks China still has a demand for U.S. soybeans, and that U.S. farmers would like to see agricultural trade between the two sides "get back on par." "I think many of those (trade issues between China and the United States) are not related to agriculture at all," Lutz said. "We're just the consequence of that, but I'm optimistic." According to Lutz, whether Beijing and Washington can properly resolve their trade frictions will undoubtedly be a major factor affecting soybean prices, which, if they go up, will in turn pull up the prices of other commodities. "It lifts all boats when it does," Lutz said of a potential trade deal between the two countries.